We all know that agriculture is a thriving sector in all economies of the world especially Nigeria(maybe because I'm Nigerian). As we all know food business is big business because everyone must eat to survive. Agribusiness in Nigeria is still very profitable because more than 180million Nigerians need to eat. Agribusiness also offers the opportunity to get wealthy and also add value by providing food. 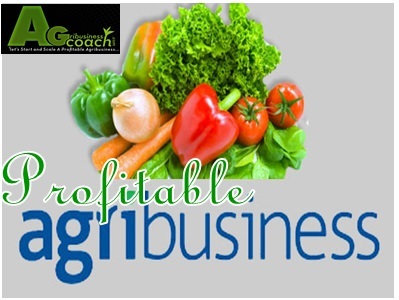 Agribusiness generally involves crop production, meat production, food processing, distribution, and marketing. In this article, we have detailed profitable agribusiness ideas for Aspiring Entrepreneurs in Nigeria and beyond. This involves the production of vegetables like fluted pumpkin (ugu), cucumbers, watermelon, cabbage, carrot, tomatoes, etc. Our local vegetable farming like shoko, ewedu, and uha is also profitable. Vegetable farming is highly profitable more than most crops. How to successfully grow onions in southern Nigeria and make a lot of money. commercial vegetables to plant and grow rich. Maize is a very important grain crop for food and industrial raw materials such as making of ethanol and animal feeds. Maize can also be processed into a variety of food products like corn flakes, akamu or custard, etc. There is a ready market for maize, especially for fresh consumption and animal feed production. click the link below to read on successful maize farming business. Commercial cassava farming has been a very profitable farming venture for Nigerian farmers. Cassava tubers which are in very high demand are the raw material for producing 'garri' which is a staple food for the Nigerians. Cassava farming venture is known for its low input- high output nature. Many industries in Nigeria use cassava as a major raw material so you don't have any trouble selling your products. Snail farming is one of the very profitable farming ventures you can go into. It's easy to start and doesn't require too much professional knowledge before startup. Snail farming is very profitable that's why it is called a gold mine. Firstly, Snail meat is a very delicious delicacy consumed in Nigeria and all over the world. It is very healthy and nutritious and prescribed to all because it's not red meat and also has high protein, vitamins, and minerals content. If you are a commercial snail farmer, Hotels, fast food, restaurants and malls such as Mr. Biggs, Tantalizers, Chicken Republic e.t.c will be your regular customers. All you have to bother is how to meet their demand. They will only need your assurance of regular supply per week. There is also a large market for snail meat in the international market if only you can do a good packaging. We all know that Nigeria has a thriving poultry industry. This industry which includes broiler production and egg production need poultry feeds. You can make so much money with poultry feed production or wholesale supplier. You can as well open a factory where you compound feeds for farmers. All you need are basic feedmill machineries. Read more on how to produce poultry feeds. The poultry industry in Nigeria is booming and very profitable. Poultry farmers into both meat and egg production are smiling to the bank steady. Read the arcticles below on poultry farming and get inspired. Catfish farming is one of the profitable agribusiness ventures. One could easily make a lot of Money venturing into commercial Catfish farming. You can read my detailed guide on how I started my own catfish farm. Your prospective customers for fresh or processed catfish are restaurants, pepper soup joints, hotels, households and even for wholesale supply to processing factories. How to start catfish farm. One of the easiest agribusinesses you can start without stress is a catfish processing business or catfish smoking business as it is popularly known. Catfish processing business simply involves buying catfish in wholesale from farmers or using harvested catfish from your catfish farm, cleaning and washing it, smoke-drying it, packaging it in a branded polythene pack, and marketing it by distributing it to supermarkets, retail outlets, open market and consumers. Read more about it by clicking the link below. Okra is a very popular and nutritious vegetable farmed and consumed by many people across the country, but some Nigerian farmers hardly see okra farming as big business. However, Okra is very profitable and you can start harvesting in 40-60days depending on the variety you planted. Cucumber farming is easy and you can start it without any formal training. In fact, you can start your own cucumber farm without any formal experience in farming or business. Just read my article on how to start cucumber farming business. There are many profitable agribusinesses out there. These are just a few out of many. For me I am doing catfish farming, cassava farming, okra farming and will raise broiler chicken later this year. Which are you doing and what are your success stories and challenges, tell us in the comment box below. Also like, share and subscribe for more updates if you have not done that already.